Rush Limbaugh: Leader of the Republican Party? While he's been a wildly successful radio talk show host for the last two decades, Rush Limbaugh has seen his notoriety, and political influence, increase significantly since President Barack Obama took office in January. Limbaugh infuriated the Left with his statement that "I hope he fails" in reference to Obama, and Democrats are actually running advertisements attacking him. Obama himself warned Republicans that they cannot listen to Rush Limbaugh and get things done. I started watching Limbaugh's TV show in 1992, when I was a Democrat and supported Bill Clinton for President. After Clinton got elected and proposed what was derided as the largest tax increase in American history (it was actually the second largest) and began his push for socializing the health care industry among other Leftist policies, I quickly began to realize that my conservative ideology didn't fit in the Democratic Party. Limbaugh's commentary was important as my philosophy of government became more defined. Limbaugh represents an important voice in the conservative movement, which includes, but is not limited to, the Republican Party. Many of his listeners are active in state, local and national politics. While "moderate" Republicans wring their hands about Limbaugh and worry about the need to broaden the Republican base, they are missing the point of his radio program and Limbaugh's role in national politics. Limbaugh isn't running for anything. His role has always been to articulate the conservative philosophy. Do Republicans need to reach out? Yes, and they can use Limbaugh to their benefit. Sixteen years ago, disgraced ex-President Clinton made himself look like a crybaby by complaining about Limbaugh, and now Obama is making the same errors Clinton did. When the President of the United States complains about a radio talk show host, he demonstrates an inability to take criticism. Obama's power and political influence greatly exceeds Limbaugh's influence, especially since Limbaugh has never held (and has no desire to hold) elective office. It undermines Obama's credibility and makes him look thin-skinned to complain about Limbaugh. Democrats would be better off not worrying about Limbaugh. 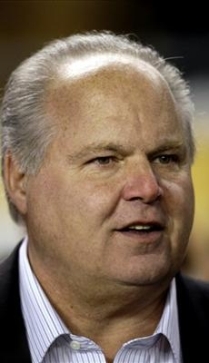 If Limbaugh is the de facto leader of the Republican Party, it is because Democrats have anointed him as such. Indiana Daily Student columnist Nathan Dixon argues that Limbaugh's influence shows that Republicans "have no leadership", but is that unusual for the party that does not control the White House? Did Democrats have a clear national leader in 2005 or 2001? Did Republicans have a clear national leader in 1997 or 1993? Did Democrats have a clear national leader in 1989, 1985 or 1981? Limbaugh has a higher profile now because he is Obama's most vocal critic. That will change as we move closer to 2012, especially as Republican presidential campaigns begin heating up in 2011. If Republicans make significant gains in the 2010 midterm elections, expect GOP leaders in the House to take a higher profile as well. For Republicans, there should be no quandary on how to deal with Limbaugh's increased notoriety. First, they should take a cue from him and criticize Obama more frequently and more harshly. After all, Obama is the Democratic Party's leader right now, just as Bush was the GOP leader from 2001-2008. Democrats knew this, and were attacking Bush as soon as he took office. If we're going to win the White House again, we have to lay the groundwork now by explaining why Obama's policies are counterproductive and/or destructive and propose alternative conservative solutions. Second, they should stop fretting about Limbaugh alienating people and simply go about the work of rebuilding the party. Limbaugh will always be Limbaugh, and (despite Democrats' best efforts to claim otherwise) Republican Party officials and Republican candidates are not Limbaugh. Voters are intelligent enough to separate the opinions of a radio talk show host from a Republican candidate for Governor, House, Senate or President. Limbaugh does not threaten the GOP's ability to expand the voter base, and whining that he does makes Republicans look weak. As a matter of fact, if Republicans are losing elections because of Rush Limbaugh, they are incompetent and inept and deserve to lose anyway.